Grape and Wine Tours offers exciting wine escapes to magnificent Niagara Wine Country! Discover some of the most incredible wines, stroll through grape vineyards. Enjoy a multi-course lunch or dinner tour at a scenic winery location. As our guests you will discover exclusive boutique wineries tucked away in the vineyards and valleys of wine country. Choose from romantic courtyard settings, bistros with expansive vineyard views, exceptional award winning winery restaurants and elegant hillside gourmet picnics. Niagara Region has wines worth discovering! We will ensure each and every guest enjoys a one of a kind momentous experience on any of our tours! Consider us your complete resource for wine country travel and corporate meeting planning. 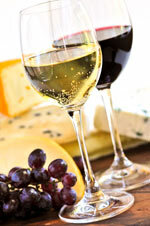 Grape and Wine Tours offer custom tour packages for meeting and event planners, travel agents, associations, and clubs. We create rich magical experiences for corporate getaways suitable for both wine novices or the wine tour elite. We pay attention to detail so you can relax and enjoy your tour. Traveling by Van, Coach or Limousine with pick in Niagara and Toronto. We offer Daily Afternoon, Lunch & Dinner Wine Tours, Spa Packages, Wine Maker Dinners, Wine Getaways, Gourmet Cooking Classes, Golf & Wine Tours, Wine Seminars and much more! Located at "The Great Mountain Center"